iPad typing without tears, and now on iPhone too! When it comes to on-screen keyboards, bigger IS different, and PadKeys is built to take advantage of the larger screen size on tablets and modern phones. Stay with the flow when it's time to type a number or symbol or you need to move around, because the needed keys are right there in the main layout. And we use the full width, not just the middle, to display word suggestions. Ergonomics aren't sacrificed either. 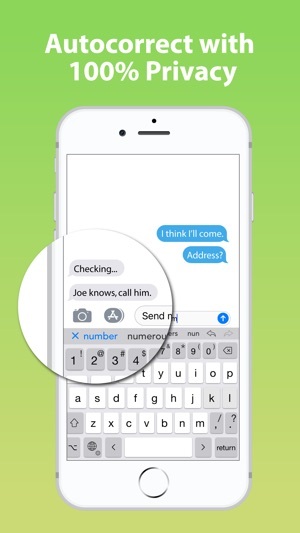 The main keys are big enough to type fast, and autocorrect is fine-tuned for catching common finger misses. 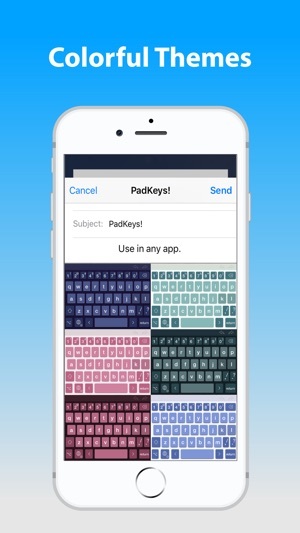 You'll find using PadKeys is almost like having a full bluetooth keyboard -- without the weight and bulk! 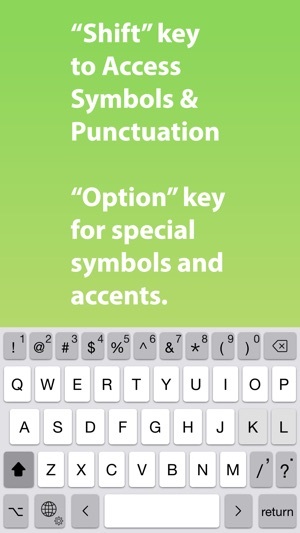 • Dedicated keys for accented characters in your language. 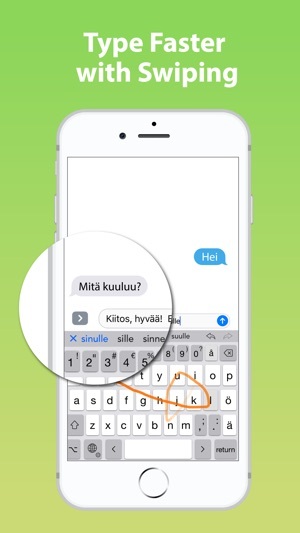 • Option switch for typing other symbols and accented characters. • “Short” layout option for more screen visibility in landscape orientation. 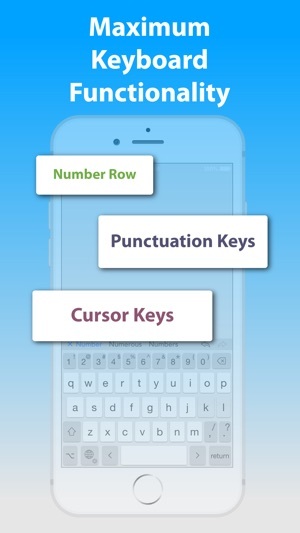 • Swipe input (trace words with your finger), and flick up on number and punctuation keys for shifted versions. • Privacy friendly (“full access” is NOT required for most functionality, including autocorrect). Languages / layouts supported: English (US and British / UK / Aus, Dvorak), Danish, Dutch, Finnish, French (France and Canada), German, Italian, Norwegian (Bokmål), Portuguese (Portugal and Brazil), Spanish, and Swedish. • If you've used PadKeys for years, you can now show your appreciation with a donation from within the app! Thanks for listening and implementing or considering several of my suggestions! Emojis as suggestions in auto correct would be wonderful! That's actually become essential to me, somehow. Colon and " keys are too hard to find for how commonly they are used. Please allow these as a long -press from period or comma key? SELECTING text with arrow keys would make my year, but I have a feeling iOS limits that. Allow the user to place keys wherever we want! I'm talking about delete, return, comma, period, arrows, symbols, not letter keys of course. We all develop habits and I'm not interested in changing mine concerning where I expect keys to be. I would buy you dinner for that feature alone! Thanks for suggestions, we've implemented opt-lock in 4.3. And just swipe up on symbol keys to get the shifted version – no need to long-press. Emoji autocorrect is under consideration. Please join the forum discussion on our support site on the topic of the colon key. We'd like to do something there but feel we need a bit more input first. No iOS keyboard deserves five stars, but fortunately it is easy to switch between them if you have only a few installed. I think this one is an ideal companion to the standard iOS keyboard, and I find I use each about 50/50. To squeeze more functionality in, the buttons are a bit smaller, making speed typing a little more awkward. But features like the left and right navigation buttons and quick access to special characters often make this keyboard better for editing. A lot of thought is being put into this keyboard, and it continues to evolve and improve. I give onoy four stars only because there is no five-star keyboard, but I could see this evolving into one. Options do not work. Swipe up does not work. Etc. Today, December 13, I received a notice that the developer had responded to my review. THREE MONTHS AFTER THE FACT! Oddly, their response is dated, September 7! In any event, I do not post reviews without carefully assessing and testing an app. They may want to *claim* that the their app didn’t have these problems, but it certainly did at the point I posted my review! HERE'S THE REVIEW—POINTS #3 and 4 AND THE CONCLUSION WERE TYPED USING PADKEYS TO SHOW HOW WELL IT WORKS! 1. The setting to turn off the Suggestions Bar does NOT work! I'm on an iPad and it is supposed to! 2. The option to swipe up does NOT work. Swipe up one 1 and the exclamation point is NOT entered. 3. The keys are too small and the layout far too cramped. I mkaw Fae more mistakes than with Apple's standard keyboars. One has to type much more slowly, and thwee are till more mistakes. 4. The BIG BLADK BOLDED SHIFT KEYS looks juvwnilemandnisndisteacrinf. OK. Let's fix that. Itnlooks juvenile and is distracting. 5. Love the inclusion of the cursor keys! Wish that Shift-cursor would move by words! 6. A forward-delete command would be helpful, too. Oh,mqell.m Thenquedf for a good keyboafd continues! Hi, appreciate the detailed feedback, but most of these items are actually implemented and work as or close to you are requesting. Please contact us at our support site and we'll get you up and running! About the key size, there's a tradeoff there. You can't bang away on PadKeys quite as fast as a simpler keyboard, but with a bit of practice it can still be quite usable. The best keyboard for a given situation depends on how frequently numbers and punctuation are being used. © 2018 Natural Designs Software, Inc.